First, view the image down bellow. 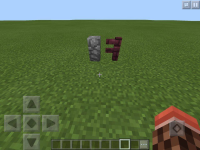 2.Place down a Nether Fence to the right, just like in the picture. After that you will see that the Nether Fence has a weird possition, and it tries to kinda connect to the Cobblestone Wall.